Lisbon Metropolitan Area is indeed one of the most relevant regions of all Europe. 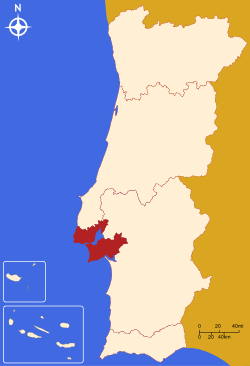 The municipalities located at the north side of the Rio Tejo (Tagus River) - Amadora, Cascais, Lisboa, Loures, Mafra, Odivelas, Oeiras, Sintra and Vila Franca de Xira -, are included in the Lisbon District. The municipalities located at the south side of Rio Tejo - Alcochete, Almada, Barreiro, Moita, Montijo, Palmela, Seixal, Sesimbra and Setúbal -, are included in the Setúbal District. It's the largest population concentration in Portugal with more than 2,808,000 inhabitants (more than 1/4 of the Portuguese population). The active population exceeds the 1.3 million. About 33% of the national employment is located here and this region contributes with more than 36% to the Gross Domestic Product. It covers and area of approximately 2,960 Km2 (about 3,2 % of the territory of Continental Portugal.